Starting point is the attractive amenity site at foot of Slieve Croob (301453 A) with plenty of parking. This is already at a considerable height of 350m, making tops in the area an easy enough task. Walk south along road and then turn right and uphill, passing sheep, horses and the call of roosters! Turn left at brow of hill onto a gravel lane (298451 C) with expansive northern views for company, as the track climbs Slieve Gullion comes into focus. At the gates head left for the hillside. Walking is easy and a number of rocky outcrops provide targets. A small pool of water had an enormous looking dragonfly darting about on the way to the summit in a short 20 minutes. This has a number of stones which may or may not have some significance? What is not in doubt is the views which all knit together perfectly. 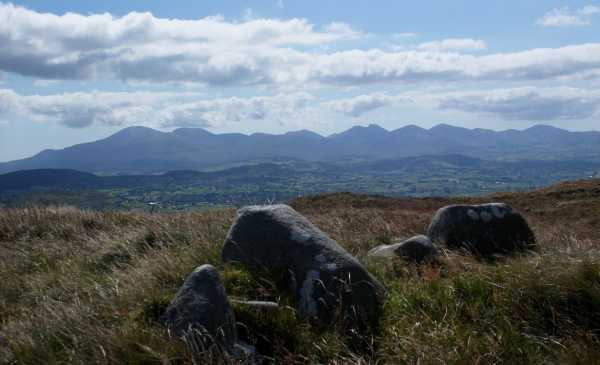 East to S Croob, Irish Sea and Isle of Man, south to the seriously impressive Mournes, Slieve Foye and Cooley Hills with Slieve Gullion, North and west to the expanse of Lough Neagh, the Sperrins, Antrim and Belfast Hills and Belfast itself!